On my first trip to Japan, my host took me to an up-market hot-springs resort on the island of Awajishima. There I was introduced to a small tiled “box” within the large soaking tub. I noticed there were small panels along the sides, but didn’t think anything of it until I entered the water and felt as if I’d been zapped with a cattle prod — an electric current was running through the water! After my initial horror, I discovered the sensation was tolerable as long as I remained in the middle of the space. 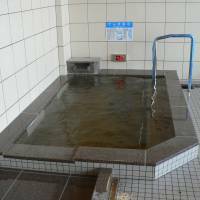 I have since seen a similar bath in Kyoto. So, what the heck is this and what is its purpose? I have to say, I’m a little horrified too. Where I grew up, we were taught that water and electricity don’t mix. As a child, I distinctly remember feeling uneasy whenever I took a bath, painfully aware that a total stranger might burst in at any moment, toss a radio or hair dryer into my bath water, and I’d be toast. Bath-time electrocutions were reported regularly in the police-blotter in my hometown newspaper, and were a staple of television throughout my impressionable years. It wasn’t easy to shake such images from my mind as I went to work on your question, but the topic was so electrifying that I was soon fully immersed. 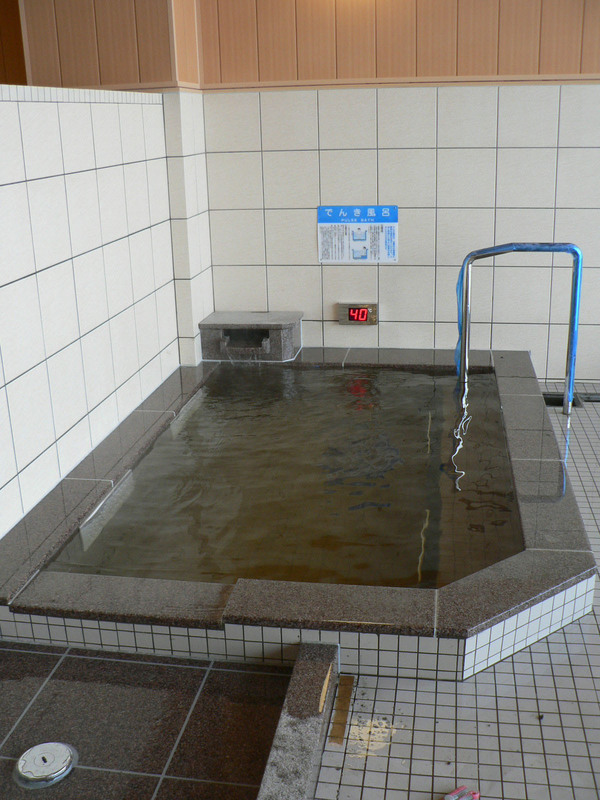 I established that the baths you described are called “denkiburo” (“electricity baths”) and are also found in public baths, saunas and sports clubs throughout Japan. It’s a wonder I evaded them all these years. Here’s how a denkiburo works: a low-level electric current runs between electrode plates installed below the water surface on either side of the bath. The bather experiences the electric current as a pins-and-needles tingling, expressed in Japanese as piri piri. Some people seem to find this sensation relaxing, while others describe it as downright frightening. Either way, the supposed benefit is relief from katakori (stiff shoulders) and back pain. There’s no scientific proof for this, as far as I could determine, and manufacturers and bath owners are careful not to make health claims. There’s also a rumor that denkiburo reduces sperm count, but I couldn’t find evidence to support that either. So how much electricity actually passes through the body? That depends on many factors, including the mineral composition of the water and how close you get to the electrodes, but it’s less than you can expect from a stun gun. The denkiburo at the Kintoki-yu in Nagoya, according to that bathhouse’s website, delivers “less than 2 volts and 1 ampere, for moderate numbness.” Stay clear of denkiburo if you’ve got a pacemaker installed; even a small jolt of electricity can cause it to malfunction. They’re also not recommended for people with heart murmurs and any of a number of other medical conditions. The history of denkiburo is a bit murky, but they’ve clearly been around since at least 1928, the year mystery writer Juza Unno published a story called “Denkiburo no Kaishi Jiken” (“The Case of the Suspicious Death in the Electricity Bath”). Early denkiburo were crude devices, and completely unregulated, but as far as I can tell, in real life no one has ever kicked the bucket in a denkiburo. I paid my ¥450, left my clothes in a locker and opened the sliding glass door into the baths. After a good wash at the faucets, I wandered through the tub area until I located the denkiburo in a corner of the soaking bath. It was a U-shape partition, open at the front. This allowed me to sit just outside it, water up to my neck, while I gingerly extended one hand into the denkiburo, as far from the side-wall electrodes as possible. I didn’t feel much of anything, so I inched forward, putting all four extremities into range. I felt an unpleasant prickling sensation, but it was bearable, so I turned around and began to back my whole body into the space. I got halfway in, enduring maybe three seconds of exposure, when my entire chest contracted painfully and I was sure death was imminent. I shot the heck out of there. As soon as I vacated an elderly lady moved in, and stayed a good long while with no apparent ill effect. Bath owners install denkiburo as an “attraction,” according to a sales representative at Osaka-based Konishi Electric Co. Ltd., the main supplier of such systems. That’s because people today patronize public baths to relax rather than to get clean. I had to wonder, however, if a numbness-inducing, skin-prickling bath truly serves as an attraction. So I went back to the bath near my apartment and posed that very question to the lady at the front desk. Does anyone — other than morbidly curious folks like me — turn up just for the denkiburo? “Sukina hito wa totemo suki desu yo,” she assured me. People who like them really like them. This column is now on a bi-monthly schedule, appearing next on July 15. For more on this topic, please visit my blog at alicegordenker.wordpress.com. Puzzled by something you’ve seen? Send a description, with a photo, if possible, to whattheheckjt@yahoo.co.jp or Alice Gordenker, Life & Culture dept. The Japan Times 4-5-4, Shibaura 4-chome, Minato-ku, Tokyo 108-8071.